Google Calendar's gallery of interesting calendars lets you add some useful features: show week numbers, the day of the week, sunrise and sunset time for your location. Some of these features should be available as options because they're difficult to find in the list of calendars and they clutter the interface. Google's decision to remove public calendar search had a strange side effect: users can no longer find public calendars with features that are missing in Google Calendar. 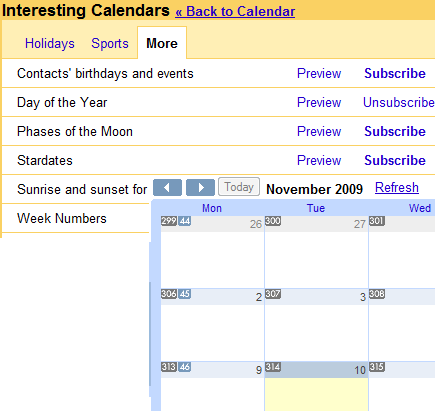 A post from 2007 explained how to show week numbers in Google Calendar by searching public calendars. I wish I had to try this, but Google calendar is down here in Swtzerland since this morning (since 3 hours min) ! There are some reports that Google Calendar is down, but not many people seem to be affected. Before I used this (http://sites.google.com/site/gcalweeknumbers/googlecalendarweeknumbers) to see the week numbers. IMHO, every calender application should provide an option to display week numbers. Apple's iCal still doesn't support this. google calender seems to be buggy at the moment (in germany). can't add or delete calendars. Mine is still down...has been since this morning here in the UK. It's a real pity they remove the gallery and search for public calendars... That was nice. Before any scheduling disasters happen, let me point out that different countries number weeks differently (it all depends on what counts as the first week), so watch out! Plah! Still can't see weeks in the small calendar which displayes days for the whole month on the left. One more column there. Google knows everything so should not be impossible to check my location and decide week numbering based on country contention. Can we get this so that the week numbers start the numbering from an arbitrary week? my week one in in September!